Catherine’s world changed after she had been on a weekend course in beginners' basketry with Jane Wilkinson. She became passionate about willow and the low impact, sustainable nature of weaving with willow . We then went on to obtain Millenium Forest for Scotland awards to promote traditional willow and woodland craft skills. In 2000 we moved to the Isle of Eigg where we planted willow and built a workshop. 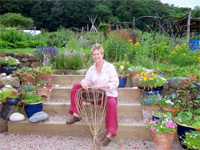 Catherine developed her skills with training from Joe Hogan in Ireland, and then went on to sell her baskets. She also began teaching and demonstrating basketry and exhibiting her work. 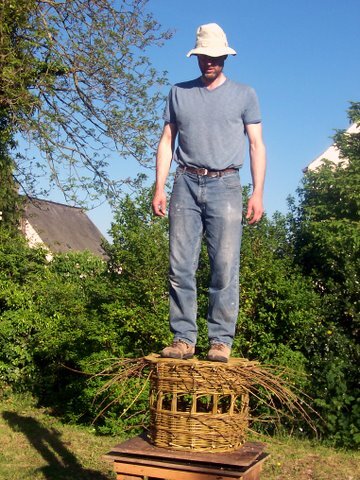 Catherine sustained a permanent shoulder injury in 2004 and found that she needed Pascal to help with the bigger willow rods; he then got the bug and is now a trained basket maker. In 2008 Catherine was awarded a Scottish Arts Council grant for training from Lois Walpole in France, in the use of recycled materials for basketry. We are still as passionate about willow and all its uses. We continue to promote the traditional skills of basket-making and strive to demonstrate it’s relevance as a viable source of employment and as a means of reducing our reliance on unsustainable plastics.